"Comforting and quick pasta dish. Use any dried pasta shape." 1Bring a large pot of lightly salted water to a boil. Cook elbow macaroni in the boiling water, stirring occasionally until cooked through but firm to the bite, 8 minutes. Drain. 2Heat olive oil in a large saucepan over medium heat; cook and stir onion in the hot oil until translucent, about 5 minutes. Add diced ham; cook and stir until ham pieces are slightly browned, about 5 more minutes. Stir cream of mushroom soup and milk into ham and onion, stirring until smoothly combined. Mix in Cheddar cheese, salt, black pepper, and peas. Simmer until thickened, about 5 more minutes. 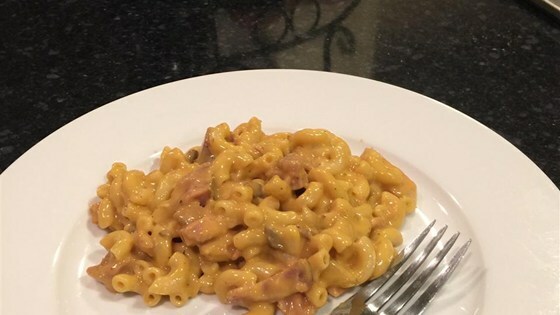 3Toss cooked macaroni into ham mixture and serve.